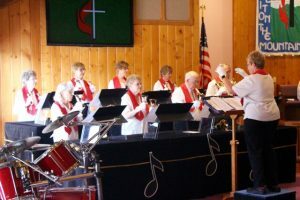 Our choir provides the music for all of our worship services, except the third Sunday of each month, when our Bell Choir provides the special music. We enjoy many seasonal participants and invite any who come to Estes Park to join us! 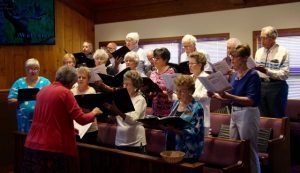 The Chancel Choir will be taking some time off while we continue our search for a new Music Director. The bell choir is made up of 8 -11 members. We have three octaves of bells, so we can play 2 or 3 octave bell music. We also have 2 octaves of chimes for occasional variety. They are used alone or sometimes with the bells. The Bell Choir plays on the third Sunday of every month, Easter Sunday & Christmas Eve. We welcome alll who are interested in playing handbells. We use a color coding system, so if you can count, you can play bells. We work hard, but have lots of laughs and fun. 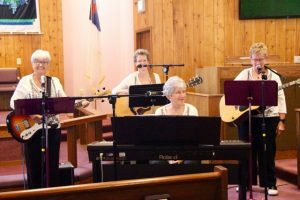 Our talented women’s ensemble, Believe, provides special music for worship. To get plugged into any of these music ministries, please contact the church office.